The Crane Clan, Left Hand of the Emperor, was known throughout Rokugan for its skilled duelists and artisans. The Crane were also noted courtiers, wielding great power in the courts of the land. The Crane were founded by the Kami Doji. They pursued excellence in all things, and the traditions established by Lady Doji were now customary in the Emperor's Court. The formal dueling system, iaijutsu, was established by Doji's husband, Kakita. Their preferential status with the Imperial line was renowned and throughout history the clan had had fewer taxes and more gifts heaped upon them. They were the masters of the courts and had the status and wealth commensurate with such a position. The Crane consisted of four powerful families in complete symbiosis, no two families overlapping in duties. 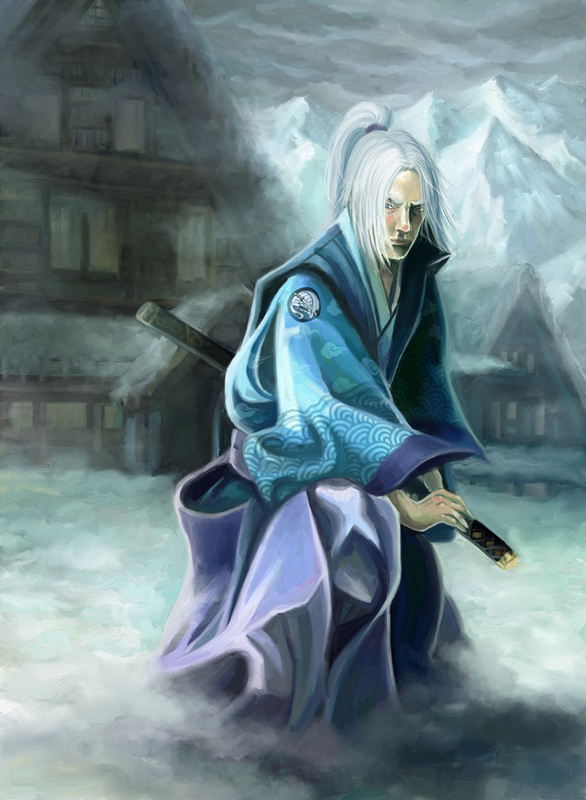 The Doji family were the voice of the clan and control most of the politics within Rokugan. The Kakita family were famed for their iaijutsu duelists as well as their skills as artisans. The Daidoji family were the military might of the Crane as well as handling the things too dishonorable or dangerous for the other families. The Asahina family were the only shugenja in the clan, and spent their time in peaceful meditation and creation of nemuranai. The Asahina were in theory a fifth family, as the Yasuki family were once Crane. Their path however led them away from the Crane to the Crab Clan shortly after the founding of the Asahina. The lands of the Crane Clan stretched for miles on every side of the previous capital Otosan Uchi. Everything from the foothills of the Mountains of Regret in the north to the Asahina fields of the southern peninsula were claimed by the Crane. Their lands also covered most of the coastline of Rokugan. The province farthest to the south was once owned by the Yasuki family, but it was split between the Crab Clan and the Crane after the Yasuki defected to the Crab. While tensions in this area had been mostly low due to the peaceful Asahina living nearby the Crane still maintained Niwa Shita no Kage Toshi as a defensive fortress guarding the Crane side of Shio Senkyo no Riku. The people of the Crane lived a good life. The fields were rich, the taxes were light and the magistrates that patroled the lands pride themselves on their honorable and just nature. The northern parts of Crane lands bordered the Phoenix and Dragon Clans, the lands of the Emerald Champion and what remained of Otosan Uchi. These lands had been mostly peaceful throughout history, with only a couple of exceptions. The area was filled with merchants who run a brisk trade with the Phoenix as well as with numerous shrines maintained by the Brotherhood of Shinsei. 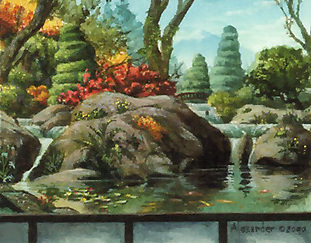 The lands of the Emerald Champion were technically owned by the Emerald Champion, but the frequency with which the Champion was a Crane meant the lands were usually under Crane control. The coastal regions of the Crane stretched across ninety percent of all of mainland Rokugans coast. This effectively gave the Crane a major hand in all seagoing trade. There were multiple established ports and marketplaces along the entire coast, making the Crane the most effective means of transporting things by sea. Trade roads also run down along the coast, and were heavily patrolled by the Daidoji. The majority of the Crane population lived along the coast, and the cities were packed with people from all corners of Rokugan. The western lands of the Crane Clan were one of the keys to the prosperity of the Clan. The fertile rice fields were cultivated by the farmers and heimin of the Crane, and although the lands had often been disputed by the Lion Clan, the Crane maintained they had been given to Lady Doji by the Emperor Hantei when the lands were divided. The Lion frequently made forays into the lands to plunder their riches. Shiro no Yojin, the castle that was once the defence on the western border, was taken during the Night of Falling Stars several centuries ago, and had never been reclaimed. The crops grown in the western lands of the Crane were one of the primary sources of food in Rokugan, and were exported to nearly every corner of the Empire. The richest fields could be found in Osari Plains, named for a farmer who stood against an invading Scorpion force centuries ago. To the south of the area sat the remains of Beiden Pass. For centuries the pass had been heavily contested by the Crane, Scorpion and Lion until its destruction. The province in the southern Crane lands was Kenkai Hanto, home of the Daidoji family. 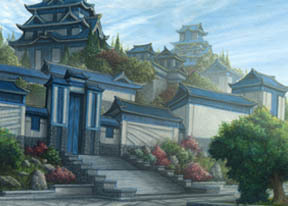 Several bustling cities could be found in this area, and bandit activity there was virtually unheard of due to the vigilance of Daidoji patrols. The areas to the far south of Kenkai Hanto had sporadic swampy reaches, where a variety of creatures were rumored to have been spotted including kenku, nezumi and naga. A small grove of stones could be found to the far south of the peninsula. The origin of the stones was unknown, but they shine in the light of a full moon as if a beacon were upon them. The Fantastic Gardens of the Crane were delicate beauties that were spoken of throughout Rokugan. They covered huge tracts of land reaching up to thirty li (miles), having been converted from arable land into pleasurable gardens by past Crane Clan Champions. The Crab would complain and call it a waste of land, but the vast and rich lands of the Crane afforded some spare for beauty. The gardens were works of art, containing bonsai trees, flower bushes and trickling streams that create the illusion of careless perfection. They were the result of generations of gardeners who spent their lifetimes perfecting their art. In addition to being art the gardens often symbolized something mythical, spiritual or historical. The Crane are both respected and hated by the other clans. None however could dispute their economic importance to the Empire, essentially keeping the Empire going. The Crane attempted to keep relations smooth with all the clans, despite what they might actually feel towards some of the clans. The Crab were viewed as brutish fighters; while strong and bold, they had forgotten everything but how to fight. In a way they had almost become a part of the Shadowlands, with dark magic and taint. Their sense of honor and civilization had degraded, and the Crane honor them as one would honor a dog who kept the wolves at bay. It would however be foolish to engage the Crab in direct conflict. Diplomacy with the Crab Clan had been a touchy business since the fourth century when the Crane-Crab War resulted in the defection of the Yasuki family from the Crane to the Crab. Because the Yasuki took up the position as the Crab's diplomats they were not allowed within the lands of the Crane, and the Black Crane Palace where the Yasuki would host visiting dignitaries was barred to Crane. To help remedy these issues, the Crab had a small number of Hida and Hiruma trained as courtiers specifically for negotiations with the Crane. Crane diplomats were also the only diplomats allowed directly into Kyuden Hida. Most of these were Daidoji, the only Crane the Crab respected, making the negotiations easier for both sides.